While I was attending the ANLAClinic in Kentucky this week my Twitter feed erupted with outrage over the announcement that the NWF had teamed up with Scotts. I monitored the conversation online and kept relatively quiet. My silence on the issue was construed as apathy by a few Twitter followers who messaged me to ask me why I wasn't blogging and tweeting about how I felt about the alliance. When I was part of the organizing committee of Chicago Spring Fling and we prepared to host the second of what has now become annual gatherings of garden bloggers from across the country a PR firm representing ScottsMiracle-Gro contacted me. Our conversation ended with them offering to sponsor in part the event. I took the offer to the organizing committee and we decided to poll several of the attendees since we knew it would be a controversial connection. What we heard back was that since the GWA took sponsorship money from Scotts they would be OK with us doing it since many of the attendees were GWA members. The money we received was applied towards the rental of the bus and that allowed us to lower the cost of the bus per attendee. This is why I've remained silent. I feel like I have no room to criticize the National Wildlife Federation for partnering with Scotts since I sold out to Scotts once even though I'd made a personal pledge not to use their products about a year or two prior. I could have ignored the sponsorship offer and the organizing committee would probably have never been the wiser. But at the time we were scrambling for a way to rent a bus for Chicago Spring Fling without making the trip more expensive for the attendees who were traveling from across the country. When we were organizing the event bloggers were NOT the darlings of marketers that they are now becoming. So offers of cash were few and far between. Of all the things I've said and done as a garden blogger this is the only thing I'm ashamed of. I now feel like I can't blog on the issue because I talked the organizing committee into taking the money. Fortunately, there are a few garden bloggers who can cast stones at the National Wildlife Federation and lay the smackdown. I encourage you to read and spread their posts. Gayla Trail: What Were They Thinking? Carole Brown: David Mizejewski Defends National Wildlife Federation Partnership. Dave Townsend: 5 Ways to Help Wildlife In Your Garden Without the NWF. Margaret Roach: Can scotts really be a partner to the environment? Kathy Green: Should the Sign Come Down? Blooming Writer: Inspiring a Feeling of Fairness in the Gardening World. The answer to Gayla's hypothetical in the title of her blog post is "the money." When you need or want money you'll do all kinds of things to compromise your integrity. Although, I ask myself what the NWF was thinking in terms of the damage their connection is now going to cause their supporters. Gardeners are taking down their "Certified Wildlife Habitat" certificates and garden bloggers are debating if they should take down the blog badges. 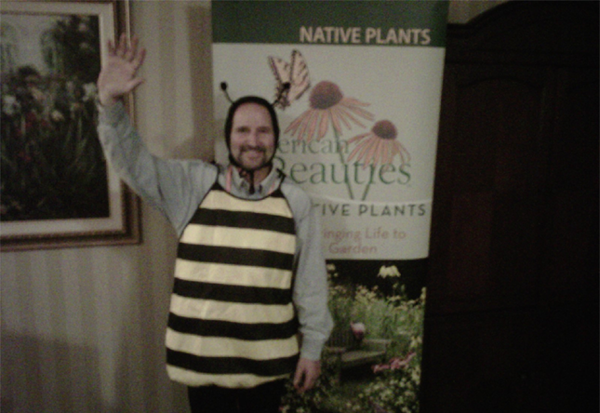 The gentleman in the costume pictured above was representing American Beauties Native Plants at a hospitality suite during the ANLAClinic. After a few free bourbons I forgot his name, but not our conversation. I noticed that his poster had a NWF logo and I asked him if he was worried about supporting the NWF given the outrage that was occurring online. He said that he believed that above everything else "the mission of the NWF was worth supporting." After meeting another representative of American Beauties Native Plants last summer at the Independent Garden Center Show I had decided that I would support their program and recommend American Beauties Native Plants. It is a responsible approach to native plant gardening by promoting locally grown and regional appropriate plants. Now I'm not so sure. The use of the NWF logo used to stand for something. I wonder if all of the gardeners who are expressing their outrage on the NWF's Facebook page will have a negative association when they see that logo on products by friends and supporters of the organization. The NWF is large enough to weather the storm but what about all the little guys that support them? UPDATE: Scotts dumped by NWF Congrats to all of you who raised a fuss about it. The National Wildlife Foundation and ScottsMiracle-Gro are parting ways. 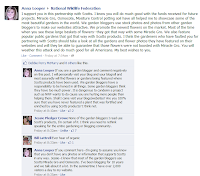 UPDATE 2: A tipster Emailed me this link with a LONG thread on the Facebook page of the NWF that features a discussion started by Anna Looper who is basically guaranteeing that all garden bloggers use Scotts products in their gardens. Um, no. Click the picture to enlarge to read it, then read the rest of the thread for a big laugh. Thanks for your thoughts on the NWF and Scotts situation. I am a member of NWF for about 20 years and an organic gardener, and yes, I feed the garden birds. I better check what brand that bird seed was sold under and I hope I didn't buy any of it. I didn't realize that we had an issue with Scotts. However, I really do not use their products except sometimes their grass seed. I use an organic fertilizer in my beds. Boy, that Anna Looper is really clueless! I can't believe that she ASSumes all garden bloggers use chemicals and steal other blogger's photos to make their own blogs "pretty". What a loon. I'm very happy to hear that NWF dumped Scotts, I hope they can partner with a sponsor that supports their philosophy instead of selling out for the money. I used to use chemicals so I don't judge those who do. Like someone said in another post here, once you know better you do better. But I wouldn't be crazy enough to claim that all garden bloggers do use chemicals or that we all take pictures from other places to publish on our blogs. Good grief who on earth is Anna Looper? That was like reading the Sarah Palin of garden blogs. I have used Scotts products from time to time. That doesn't mean that I have to approve of NWF getting in bed with them. I love this blog. It opens me up to a whole crazy side of garden blogging that I would otherwise be oblivious to. The Sarah Palin comparison has to be the funniest thing I've read all week. Glad you appreciate the ridiculousness of the blog. I don't think many people get it's suppose to be like Gawker. Some people in the niche don't appreciate it, but they should consider themselves lucky I'm not moderling this blog after the DList. 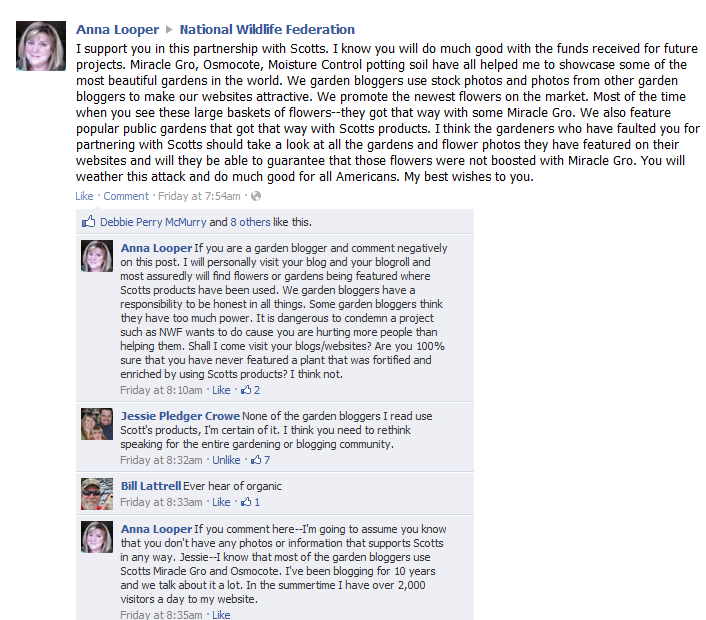 "Sarah Palin of garden blogs" hahahahaha-exactly! His name is Tim Kane and doesnt he look great as a BEE!? I hope you find this blog a useful garden blogging resource. Sometimes I may reply to comments with my MrBrownThumb account or I may reply with my Garden Bloggers account. Hope this isn't confusing. If you're looking for gardening information check out "Google For Gardeners"